Dynamic Learning digital resources bring the play in performance into your lessons with interactive tasks and audio-visual content. You can create outstanding lessons with Dynamic Learning. The flexible Lesson Builder guarantees personalised lessons packed with resources, saving you huge amounts of time. Register for a free 30 day trial. Globe Education is one of the largest arts education departments in the UK. Each year, more than 100,000 people of all ages and nationalities participate in Globe Education's programme of public events, workshops and courses. Get Shakespeare on the iPad in your classroom and engage students with Shakespeare plays in an interactive way with a device they don't want to put down. These resources will enhance your lessons with insight into the way Shakespeare is created in performance today. Play texts are in large format and in full colour throughout, with stunning photographs from Globe Theatre productions. Help your students understand characterisation, themes and language with active approaches, devised by Globe Education over the past 14 years at Shakespeare's Globe. The series provides online teacher guidance and additional resources. The English Review magazine for A-Level covers centuries of literature from the Gothic to discussions on Ted Hughes' relationship with Gawain's Green Knight. 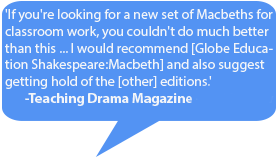 Globe Education Shakespeare iBooks Textbooks can be purchased by your school as part of Apple’s Volume Purchase Programme. It’s never been easier to bring Shakespeare’s plays to life on a device your students won’t want to put down.